Low carb and keto avocado toast is delicious, filling and very versatile – enjoy it for breakfast, lunch, snack or even dinner. My teenage kids tell me that avocado toast is the invention of millennials. Perhaps, but even midlife palettes find it quite delicious. However, I had to come up with keto and low carb avocado toast before my husband and I could enjoy this tasty dish. What can you use instead of toast? Avocado toast is very tasty. But can you create a keto, low carb avocado toast? Wondered my husband. Challenge accepted! I used my trusted recipe for 90-second bread. It’s a super quick bread that you quickly mix in a bowl, then microwave for 90 seconds. After toasting it in a greased skillet, it’s delicious, and can be used as the perfect low carb base for avocado toast. To make my life easy, I used store bought guacamole when making this low carb avocado toast. But you can certainly mash fresh ripe avocado with some seasonings if you prefer. Or simply slice the avocado and season with salt and pepper. The original version is not bad, because avocado and eggs are very healthy. But if you’re on a low carb or keto diet, or if you need to (or prefer to) avoid wheat and grains, then this keto avocado toast is a great solution, and I do believe it’s healthier. Wheat and grains are not very healthy, and coconut (and coconut flour) are a much better choice. How to serve low carb avocado toast? Low carb avocado toast is perfect anytime. It makes a tasty, filling breakfast, a wonderful snack, or make two of them for a meatless dinner. Can you make it ahead? Unfortunately, keto avocado toast is a dish that you can’t successfully make ahead. None of the ingredients – the bread, the avocado and the egg – is going to do too well if stored, even just for a few hours. Another great use for coconut flour 90-second bread is this keto grilled cheese sandwich. It’s AMAZING. And this delicious keto French toast is also based on 90 second bread. As for yummy avocado recipes, two of my favorites are baked avocado fries with spicy chipotle dipping sauce, and baked avocado egg. Low carb avocado toast is delicious, filling and very versatile – enjoy it for breakfast, lunch, snack or even dinner. Make the bread: place a tablespoon of butter in a microwave safe cereal bowl (bottom should measure about 3 inches). Microwave until melted, about 30 seconds. Allow to slightly cool. Using a fork, mix in one egg, 1 tablespoon coconut flour and 1/4 teaspoon baking powder (add 1/4 teaspoon garlic powder if you wish). Microwave on high for 90 seconds. Allow to slightly cool, then carefully slice into two slices. 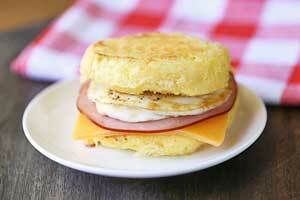 Cook the eggs and toast the bread: Heat a large nonstick skillet over medium heat. Spray with olive oil spray. Break two egg into the skillet (use greased round egg molds if you want a round shape). Cook until done to your liking. Add the two slices of bread as well, lightly browning them on each side. Assemble the avocado toast: Place the two slices of bread on a plate. 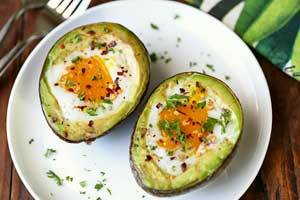 Top each slice with 1/4 cup mashed avocado and a fried egg. Serve immediately.